Beat the butter to a cream; gradually beat in the sugar and add the grated rind; then add, alternately, the milk and the flour sifted with the baking powder; add the egg-whites and beat vigorously. Bake in a tube pan about fifty minutes. 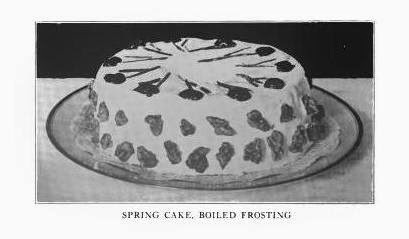 Cover with boiled frosting and, at once, decorate with halves of cherries, angelica stems and candied violets. Prepare in the usual manner, boiling the syrup to 238 degrees by the sugar thermometer, or to a firm soft-ball stage. Pour the syrup through a sieve on the beaten white of egg. Add the syrup very slowly that the frosting may be made very thick by long beating. Beat in the lemon juice very slowly, at the last. Boil. a pint of cream, and a good quantity of bread crumbs, reduce till it is quite thick, then add pounded udder, and suet, with fine chopped parsley, shallots, Tarragon, burnet, chervil, cresses, pepper and salt, nutmeg, and six yolks of eggs; lay little parcels of this in a deep dish, bathe it with yolks of eggs and bread crumbs, bake it in the oven, and serve with a sharp sauce, or stewed greens.